The spectacular Sonoran Desert provides an unparalleled backdrop for the luxury Tucson homes at Dove Mountain. Privately nestled among unique desert vegetation at the foot of the soaring Tortolita Mountains, this stunningly designed community is the perfect place to buy your luxury Tucson real estate. 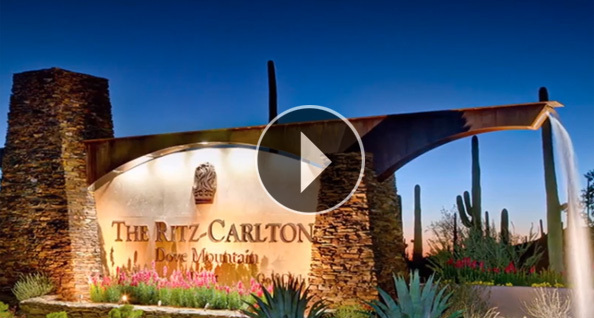 The Dove Mountain community featuring Tucson luxury residences offers every amenity. In addition to the elegant southwest inspired homes, home owners have complete access to the signature golf course as well as the restaurant and spa at the Ritz-Carlton hotel. The gated access ensures that these luxury Tucson homes are completely secure and private. For luxury homes in Tucson, Dove Mountain is the ideal location. The community is located on the north side of the city yet just a few minutes from the energy and entertainment of downtown and the University of Arizona. This area of Tucson real estate offers quick access to trendy clubs, coffee shops, boutiques and bars, yet you can quickly slip back to the seclusion and serenity of those luxury Tucson homes tucked into the desert landscape. Tucson real estate is the perfect investment as the area boasts ideal weather for every type of outdoor activity. Sunshine and warmth abound nearly every day of the year, and luxury Tucson real estate has daily temperatures between five and 10 degrees cooler than the Phoenix area. The extremely low humidity produces crystal clear air. The windows of luxury homes in Tucson are filled with exceptional views of the Tortolita, Catalina and Rincon mountains. The clear air reveals every rock, crag and canyon of these ranges with startling clarity. Your perception that all deserts are dull brown will be forever changed when you see the pinks, tans, russets and olive greens of the landscape that surrounds Tucson luxury residences. When you purchase luxury homes in Tucson, you open yourself to experiencing new activities. No longer will you be house-bound by snow, ice and cold. Tucson real estate opens the door to hiking along desert trails or through forested hills. Or, you could engage in even more adventurous activities such as rock climbing during the cooler months or mountaineering through snow during the hottest days. Owners of luxury Tucson real estate can spend their days taking slow ambles to discover the wonders of the desert environment or speed along challenging mountain biking trails. Horses thrive in this climate and there are many stables near Tucson luxury residences to house your horse or take family riding trips. All types of outdoor adventures await just outside luxury Tucson homes. The Tucson real estate at Dove Mountain offers both one-of-a-kind custom built Tucson luxury residences, or you can purchase a home with a floor plan that suits your needs. Luxury Tucson real estate offers the best of both nature and civilization. When you look for luxury homes in Tucson you’ll discover an entirely new way of integrating homes into the natural environment.